CollectiveSun was founded in 2011 on the principle all nonprofits and tax exempt organizations should have access to solar power. Our team of experts understand the financing challenges nonprofits and tax exempt organizations face better than anyone else. Our proprietary funding models were designed to minimize your nonprofit and tax exempt organizations time and effort while guaranteeing the least expensive funding options available. IRS rules unfairly dictate nonprofits and tax exempt organizations are excluded from utilizing tax benefits because of their tax exempt status. However, CollectiveSun’s innovative financing model applies tax credits that reduce the cost of your nonprofit or tax exempt organization’s solar project by 15%! - CollectiveSun can use one or ANY combination of five payment options below to fund projects including: Donations, Reserves, PACE, Bank Loans, CrowdLending (a direct loan from the supporters of the nonprofit to the nonprofit - this loan is paid back, interest rates vary from 0-8%, terms vary as well. Call CollectiveSun to learn more. 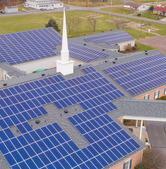 It was a genuine pleasure to work with CollectiveSun to make the switch to solar energy which will allow us to expand the vision of our church. Their expertise, professionalism, and knowledge of the industry were invaluable in making our switch to solar energy easy and affordable. I would absolutely recommend working with CollectiveSun to any church, nonprofit, or ministry seeking to go solar.